People like to get crafty on holidays. If it’s for a party or just a decoration in their house, people like to make stuff. Some things can even be a Valentine’s Day gift. But these are cheap and easy to do. The only thing you really have to do is go to the store and buy the items to create your beautiful masterpieces. You could easily find them at a dollar store or a CVS. Hanging Flower Heart- This really doesn’t cost that much. The only thing you need is faux flowers. Maybe like 12 big bunches of them. Hot glue gun, a styrofoam sheet, something to cut it with, a hook, and glitter paper. Just cut out a heart from the styrofoam sheet. Cut the stems of the flowers and glue them around the styrofoam. Then, get the construction paper and cut out parts of a bow to glue on the heart. Stick one piece at the bottom and then stick the other half on the top of the heart. Let those things dry and then put a hook on the top of the heart. There. You now have a hanging heart. Latex Painted Mason Jars- These are really cute and great to use as a decoration. All you need is a mason jar, latex paint, and a paintbrush. It’s not that hard to make. You just need to paint over the jars. Not too many coats though, the paint might chip or look weird if you apply too much paint. You can add whatever you want on it when it dries up to make it look even better. Lipstick Art- You might have some old lipstick that you might not use anymore and you just don’t know what to do with it. This craft is really simple. Just grab some lipstick, try to use pink and red, a drawing frame, a pencil, and if you want, you could use a heart template. If you are using a template, use it and draw lightly in the middle of your drawing paper a heart. After that, start from the left and start coloring your heart with the lipsticks using bold strokes. Let it dry for 24 hours and then frame it. Valentine’s Day Branch Tree- This one is popular. You just need to get a couple of thin branches but not too thin. Make sure they are around the same length. Spray paint them white. If you have to spray it a second time, then do it. Put them in a vase or something. Get scrapbook paper and make little hearts out of them and make a little hole in the middle of it. Get a piece of string, stick it through the heart and make a little knot to put them on the branch. Then get clip-on birds and place them on the branches too. Make sure the birds are evenly apart. Heart Blanket- You can use any blanket you want but the preferred blanket is a plain, light colored one to make it look nicer. You also need cardboard, a cork, and paint. Make hearts out of the cardboard and glue the cork in the back of the hearts and that will be the handle. It will make things easier. To make the hearts on the blanket, paint the cardboard hearts and, while still wet and fresh, press it on the blanket. Keep doing that over and over how many times you want. 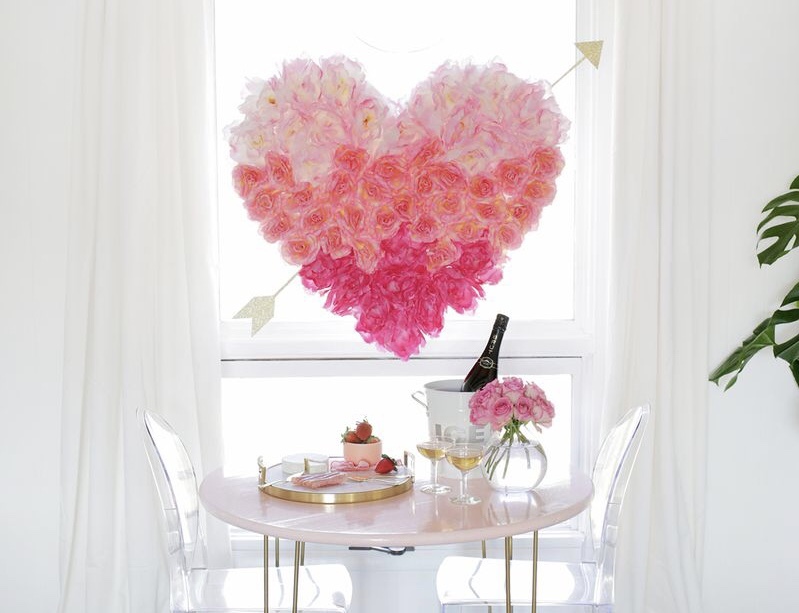 Touch up the hearts if you need to by just using a paintbrush and filling up the spaces you missed.